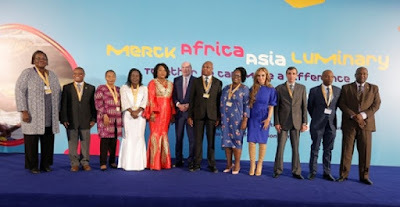 After the success of Merck Africa Luminary in Germany, Kenya and Cote d’Ivoire, Merck Foundation, a non-profit company and a subsidiary of Merck KGaA Germany, conducted the Fourth edition of their annual “Merck Africa Asia Luminary” on the 24th and 25th of October 2017, in partnership with Egypt’s Ministry of Higher Education and Scientific Research, Africa Fertility Society and the International Federation of Fertility Societies- IFFS. This is in its pursuit to contribute towards building healthcare capacity, the fourth Luminary held in partnership with the Ministry of Higher Education and Scientific Research of Egypt brings together African and Asian countries from 24th to 25th October 2017 in Cairo, Egypt. The Chief Executive Officer of Merck Foundation, Dr. Rasha Kelej, emphasised: “Merck Foundation brings more than 450 healthcare providers, policy makers, academia and researchers from Africa, Asia and CIS countries are to benefit from the valuable educational and social development sessions by top international experts in Diabetes, Fertility, Oncology, Cardiology, Women Health and Research. “We are very proud to have five First Ladies to inaugurate the Luminary. These very influential women will also be 'Merck more than a Mother' champions to empower infertile women through access to information, health and change of mind-set in their respective countries and the rest of Africa,” Dr. Kelej added. Key African Ministers to participate in two High Level Panels:Two high level panels of Ministers of Health and Gender to discuss the challenges and solutions to improve access to fertility and cancer care will also take place. The first ministerial high level panel on “Merck more than a Mother’s role in defining interventions to break the stigma around infertility in Africa and Asia,” will have Hon. Susan Shabangu, Minister in the Presidency Responsible for Women, South Africa; Hon. Betty Amongi, Minister of Lands, Housing and Urban Development, Uganda; Hon. Idi Illassou Mainassara, Minister of Health of Niger; and Hon. Zuliatu Cooper, Minister of Health & Sanitation, Sierra Leone. Others in the panel will be Prof. Richard Kennedy, President of International Federation of Fertility Societies – IFFS; Prof. Joe Leigh Simpson, past president of IFFS, Prof. Chii-Ruey Tzeng, President of ASPIRE; Prof. Oladapo Ashiru, President of Africa Fertility Society and Dr. Rasha Kelej, Chief Executive Officer of Merck Foundation will chair the panel discussion. The second ministerial panel on “The Role of Merck Foundation Together with Governments to improve access to equitable healthcare solutions in Africa and Asia”, will include Hon. Saffie Lowe Ceesay, Minister of Health, Gambia; Hon. Ngarmbatina Odimbeye Soukate, Minister of Health, Chad; Hon. Pierre Somse, Minister of Health, Central Africa Republic; Hon. Dr. Faustine Engelbert Ndugulile, Deputy Minister of Health, Tanzania; and Hon. Julieta Kavetuna, Deputy Minister of Health and Social Services of Namibia. Others include: President of International Federation of Gynecology and Obstetrics (FIGO), Prof. Chittaranjan Nalahari Purandare; Prof. Dileep Mhaisekar, Vice Chancellor Maharashtra University of Health Sciences (MUHS) India and Dr. Rasha Kelej, Chief Executive Officer, Merck Foundation will chair the panel. Over 50 countries to participate are: Nigeria, Kenya, Uganda, Tanzania, Mozambique, Angola, South Africa, Zambia, Zimbabwe, Rwanda, Ghana, Sierra Leone, Ethiopia, Congo, Senegal, Cote d’Ivoire, Liberia, Cameroon, Central African Republic, Mali, Malawi, Morocco, Tunisia, Sudan, Gambia, Burkina Faso, Niger, Chad, Liberia, Burundi, Mali, Malawi, Equatorial Guinea, Russia, Uzbekistan, Sri Lanka, Bangladesh, Nepal, U.A.E, Tunisia, India and Indonesia. “Merck more than a Mother” launched by The First Ladies of Central African Republic, Gambia, Chad, Niger and Republic of Guinea with the aim to empower infertile women in their countries. More than 450 African healthcare providers, policy makers and researchers from Africa and Asia benefit from several educational and social development sessions.